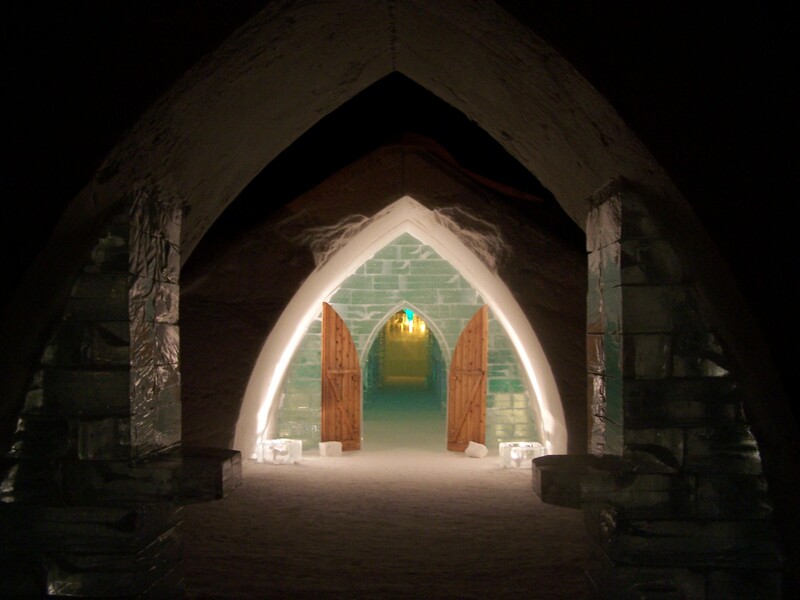 A few years ago, my then-boyfriend and I braved a chilly night at the stunning and surreal Hotel de Glace in Quebec, Canada. And while it was one of the coolest (no pun intended) experiences I’ve ever had, it was also the worst night of my life. Damp, cold, and with a pressing bladder demanding my attention, I spent the entire night in a semi-asleep state, praying for total unconsciousness. And yet, I would do it again in a heartbeat. Most people come to the hotel for just the day, to peek inside the rooms and admire the incredible architecture and carvings. But in the evenings, the hotel closes to the public and only overnight guests are allowed inside. When the staff close the big wooden doors for the night, it’s like you’re cocooned in another world, where only you and the other brave souls in there with you are truly experiencing the hotel. 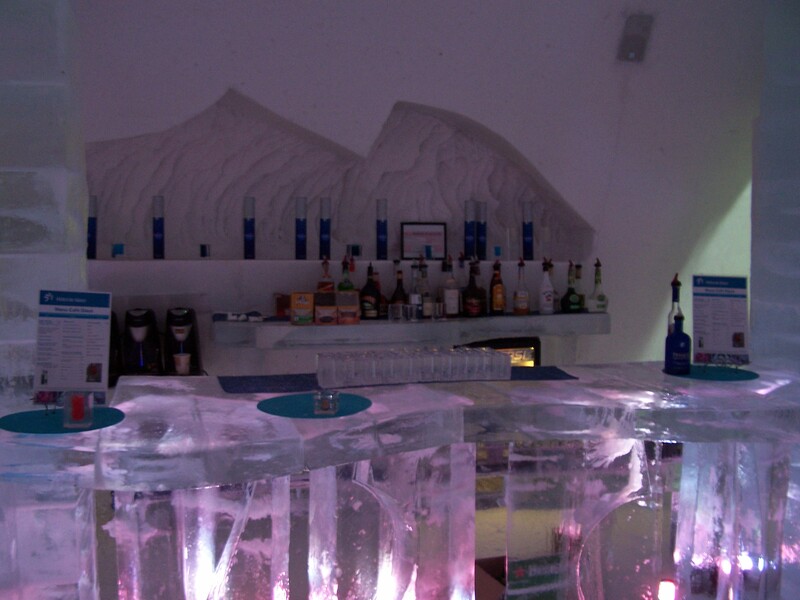 So, if you’re like me, and a night in an igloo mansion actually appeals to you (defying all common sense, I might add), then go for it. It’s incredible. 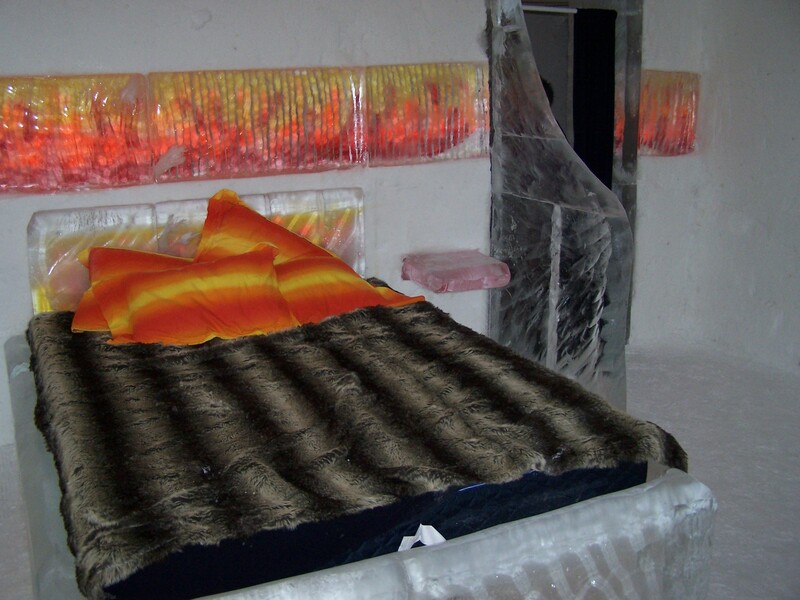 And to help you out, here are some tips on how to survive your own night in an ice hotel – based entirely on my mistakes. Size matters. Sure, the big, fancy rooms look impressive, but they’re also a lot less cozy. Book a smaller room, which holds the heat better. And while the fireplaces are a lovely touch, they’re not exactly practical, since they don’t give off heat (which seems blatantly obvious in hindsight, but still left me a tad disappointed at the time). Also, the fireplaces are vented outside, so there’s a hole in the ceiling. Not a big hole, mind you, but when it’s –20 degrees outside, well, a hole the size of a pinprick would feel huge. Soak in the tub. There are hot tubs at the hotel, and staff recommend taking a leisurely soak before you go to bed. I will admit I’m not so sure about this one. In theory, it makes sense. After all, how many times have you had a warm bath or hot shower and then fell into the most gloriously deep sleep, your raised body temperature humming along all night? However, when it’s midnight in Quebec, in February, and the wind is whipping, and your hair is frozen from the mixture of steam and frigid air, that theory falls apart. We did the soak, but the sprint from the tub to the change room sucked the warmth from my veins. Wear different clothes before bed. All your clothes that you will be sleeping in, right down to your socks and skivvies, should not have been worn that day, and only put them on immediately before you go to bed. (Don’t, like I did, change your socks before dinner and then wear those ones to bed, thinking they’re new “enough.”) Your clothes will be damp from being on your body and you’ll carry that dampness into bed with you. Less is more. You may be tempted to bundle up in more layers than a wedding cake and to wrap yourself in every piece of flannel, fleece, and furry fabric you can find. Don’t do this! All you’ll end up doing is sweating during the night, and sweat equals chills. I wouldn’t recommend doing the opposite and sleeping naked either, although some brave souls do. Just go with thin, loose, polyester material. Never wear cotton to bed, as it traps moisture. Don’t put your head in your sleeping bag. This is one of the key things they’ll tell you in your orientation, and it can’t be stressed enough. Sticking your head inside your sleeping bag means you’ll breathe into it. Which means the inside will become cold and damp. Which means a layer of ice will form atop the lining. 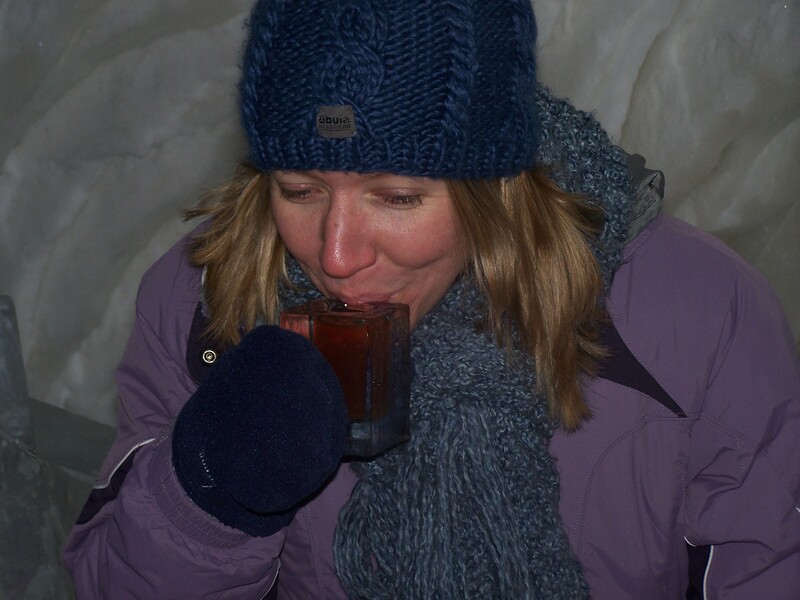 Take it from me – I tucked my head in just the tiniest bit, enough to cover the tip of my nose, and woke up with my lips stuck to the ice that had formed around the neck of my sleeping bag. Forget the romance. The hotel offers two-person sleeping bags. Awww. How cute, right? Yeah, we thought so, too. Until we unrolled it and tried to climb in. An Arctic two-person sleeping bag does not mean two people cuddled up together inside one bag. (At least, the ones at the hotel didn’t mean that.) Instead, we found two separate bags, connected with one awkward zipper down the middle. It’s a bit hard to describe, but let’s just say cuddling is impossible and every time one of you wants to roll over, you’ll end up choking your partner or elbowing him/her in the face. Drink before you sleep. Yes, this is counterintuitive to the advice I gave above, but well, when your bedroom is -10 degrees, vodka can be a very good friend. And what if, even with this advice, it’s still too cold for you to get a good night’s sleep? 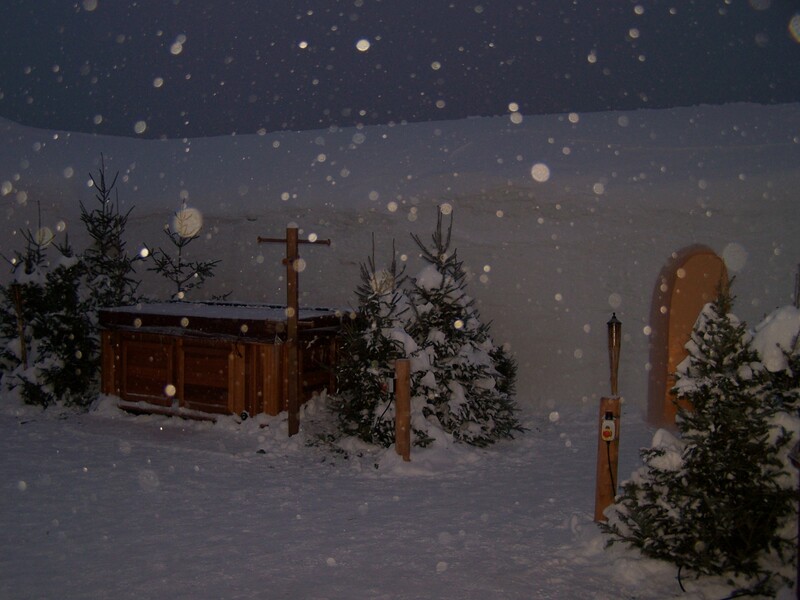 Well, there’s always the nearby chalet, with its roaring fire and comfy couches. The night we visited, one family gave up and slept inside, next to the fire, while the rest of us braved the chill of the hotel all night. So there’s no shame in caving in to warmth. Brilliant advice, and beautifully written! 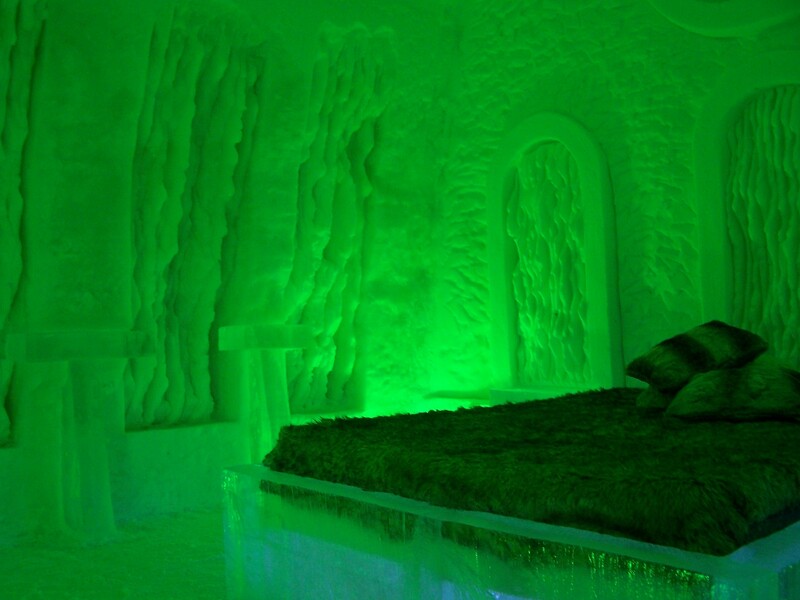 I’m in love with the concept of an “igloo mansion”…and can’t believe I put my head inside my sleeping bag, too. Well, now we know better!